Hospitality on the road to Karbala. Photo by Yousif Tuma. When you think of Iraq, what do you picture? Windswept desert, harsh sun, military convoys, guns and missiles and bombs and rubble? The Iraq unmade and broken by violence and war, by geopolitical interference? The Iraq we see in the media, battered and fractured by long years of war? Iraq is a country much like yours—culturally, religiously, racially diverse. It has its own customs and holidays. It’s full of busy markets, festivals, families living and eating and enjoying time together. It is rooted deeply in a tradition of hospitality, in sharing with each other and caring for one another. Right now there’s a pilgrimage taking place in Iraq, a stream of millions of people heading to Karbala to celebrate the religious festival Arba’een. 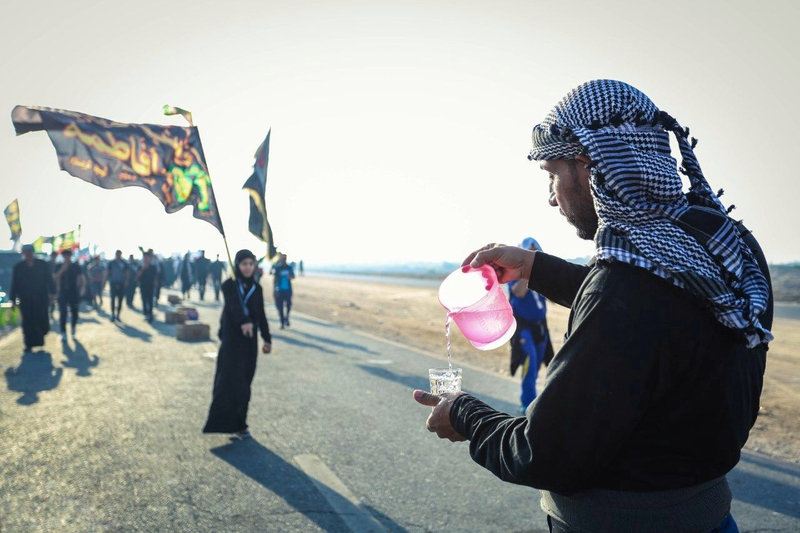 People travel on foot, miles and days at a time, so that on October 30 they will be in Karbala for a ceremony remembering Husayn ibn Ali, a Muslim Imam symbolizing freedom and compassion, the grandson of the prophet Mohammed. A young girl at the festival of Arba’een. Photo by Yousif Tuma. When Saddam Hussein was in power, he outlawed the pilgrimage. Still, people traveled, propelled by their faith. But the journey was very dangerous. People were arrested, kidnapped, or killed. In order to make the trip to Karbala, people hid in ditches, avoiding main roads and cities to evade Saddam’s forces. It’s a long journey on foot to Karbala, 10 to 15 days for most who make the trek. You can’t carry enough food and water to last the whole journey, so if you can’t go to the cities, how do you survive? All along the route to Karbala, people showed up. They set up tents to offer shade to travelers. They provided food and drink and mobile medical care. Hospitality tents on the road to Karbala.Photo by Yousif Tuma. When Saddam fell from power, the roadside hospitality didn’t stop. It grew. Now free to travel to Karbala, more pilgrims made the journey. And more people continued to show up to love them and care for them, using their own money. Now the roads are flanked with tents. But even more, people offer their houses to travelers, invite them in, do their laundry, give them a bed, feed them meals. In Iraq and across the Middle East, to welcome someone into your home is to bring them under your protection, to assume responsibility for their life, their blood. To serve a pilgrim is a deeply sacred act of faith. In Iraq, people are committed to being hospitable, to building connection and community. People want to strengthen relationships with others, to help fix problems, to bring others together, to share meals and stories. On the road to Karbala. Photo by Yousif Tuma. It’s spiritual, this give and take of hospitality. On the way to Karbala, people are united in thought—they are of one heart. They don’t see others as Sunni or Shia, but are thinking instead about how to help, how to serve others. They treat each other the same, respectfully. It’s not about the way you worship or what you think politically or which side you take. It’s not like every other day. It’s special. This is how Iraq used to be—united, hospitable, journeying together. And as millions walk a dusty trail to Karbala today, this is how it can be again. And not just Iraq. We can journey with them: remaking every day where there isn’t hatred or violence, but hospitality and love and peace. The sharing of road and bread.